On Monday I struck out to the Value Village where I found not one but two amazing discoveries. First, I came across an eight-piece Vivianna Torun Bulow-Hube for Dansk table ware setting. I don’t always cruise the silverware section but I had a memory of a time that I came across some Georg Jensen and I thought I’d try my luck again. Torun Bulow-Hube designed for Jensen as well, so I was close. She is also one of my favourite all-time designers! I also found myself in the linen section when a pair of mid-century curtain panels caught my eye. We need new curtains in our bedroom (we currently have a mis-matched set), so I gave them a wee examination. At first I noticed that they were signed David Whitehead, which I recognized as an influential English textile manufacturer. Then I saw that the design (“Denston”) was by John Piper, who was one of the most influential English abstract artists of the 20th century. So in one fell swoop, I acquired some rather important pieces of mid-century housewares. 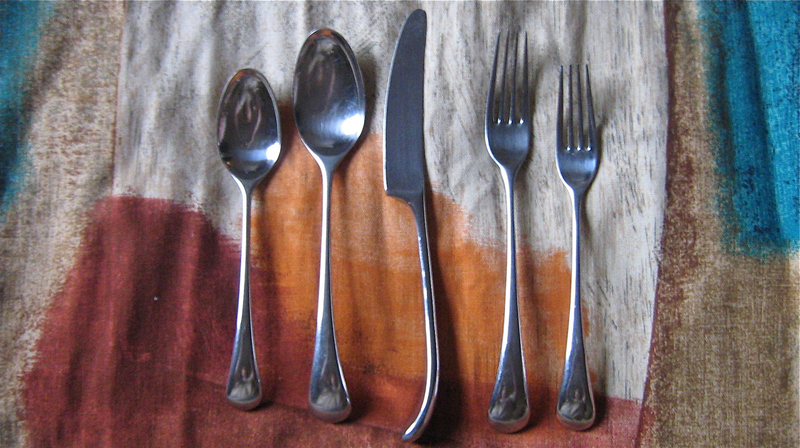 The flatware is missing one knife, but there is an extra fork. The fabric looks flawless. The next question is keep or sell? After spending almost eight months of downsizing, I am trying to keep only things that will be used on a daily basis. Is the fabric too precious to use as drapes? And I am trying to adhere to a strict, one in/one out policy, so what goes out in their place? So the solution is to put them in the Etsy shop for a few months. If they sell, they were meant for a better place. If they don;t, then maybe I was meant to keep them! The Denston fabric curtains are now back in England where they will feature in a special exhibition of John Piper textiles in May later this year. I wonder what sort of journey they have had over the past sixty years. That’s amazing! I knew they were works of art. I wish I knew more about their provenance. I learned about John Piper fabrics through an acquaintance who is also a curator at the Royal Ontario Museum. She personally collects mid century designs from England (designs from Heals, especially) and she said that Toronto is a great place to find them because so many Brits immigrated to Canada in the 1950s and ’60s. The people of that generation are now breaking up house. I imagine a smart young couple coming to Canada with these panels. But because they are in such good shape, they may have been something they had up in England, but that didn’t quite fit into their new home. My guess is that they’ve been in storage for decades. But that’s just my imagination! Please send more details on the exhibition — it sounds amazing! And thanks for letting me know they’ve arrived safely.